Tweet OMG. I have the BEST readers/fans/listeners/whatever EVER. I've been asking for a Sugar Daddy for the longest, and it feels like I've scored a SECRET Sugar Daddy! It's like half secret admirer, half Sugar Daddy. 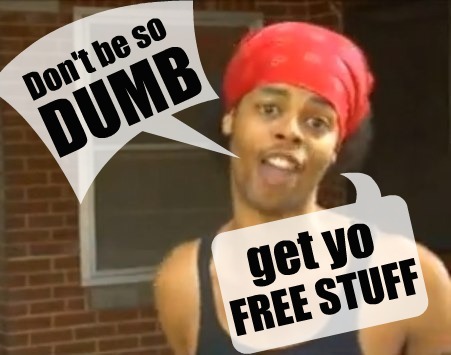 I read on your blog that you wanted an Antoine Dodson shirt, and while I don't have $20 + shipping to blow either, what I do have is the ability to make decals. So, here you go! 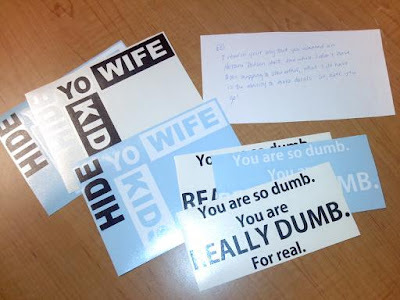 Inside the envelope were 8 decals of what the shirts I wanted had on them. I seriously have NO idea who sent these! All I know is that they're from DC and have neat handwriting, and were smart and amazing enough to look up the address to the station and send them. It could be a girl, so I should probably refer to them as my Secret Sugar Maddy from now on. [Mama plus Daddy, duh.] I wish I could thank them personally [and see if we can work something out to get love, EB ones made since I've been looking at pricing for that anyway], but hopefully they'll just see this. I'll write down all of the tweets' usernames I receive and have my coworkers pick so that it's fair. If you're in the BCS/Texas area, I'll even throw in some RenFest tickets for ya! Again- Thanks to the person who made these! If you want to come forward, please do! If not, you shall forever be my Secret Sugar Maddy.